Medigap serves an older population: 47 percent are 75-years or older compared to only 38 percent for all Medicare beneficiaries. 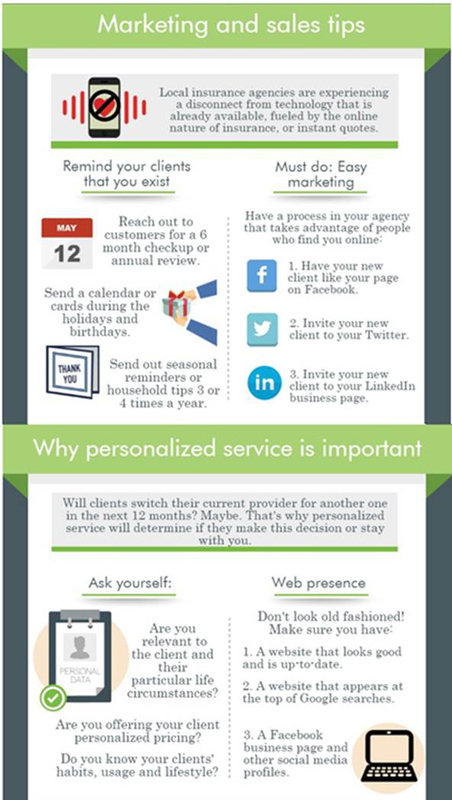 Why do so many salespeople refuse to learn new prospecting strategies and change sales tactics that don’t work? Change is the only way to grow and excel, so why not follow the path to the highest commissions, fastest closes, best meetings and most powerful relationships? Much of this reticence comes from the fact that change feels uncomfortable. Change is hard. Change makes us vulnerable. We no longer have a clearly defined path. We’re not certain where our next steps will take us or exactly what to do when we get there. Just as important, many sales leaders don’t know how to evaluate change, so they measure their reps on legacy activities — even when they know that change is essential to deliver significantly improved results. In his amazing article “Do You Lead from the Top or Within?” businessman Ali Soheil offers an insightful perspective on what it takes for leaders in various industries to keep up with the pace of change in today’s quickly evolving business world. Put simply: To lead the effort for change in our organizations, we must first change how we lead. Let me use a real-life example. A good friend of mine decided on a goal of losing some weight and getting healthy. He renovated his basement and bought some expensive exercise equipment and a fantastic sound system to stay motivated. Six months later, I asked how his training was coming along. He confessed he hadn’t done any. This is a classic case of confusing the antecedent (obtaining the equipment) with the change itself. Change will not happen until behaviors change. Every antecedent is followed by encouraging or discouraging behaviors. In my friend’s case, the discouraging behaviors stemmed from a tired body at the end of the day, a couch, a bag of chips and his favorite TV show­ — things he had no plan to overcome. As leaders, we make the same mistake every day. We get comfortable and declare a “win” too soon when all we’ve really done is introduce the antecedents. When you make changes which impact your customers or employees, you must take adequate time to understand the implications and plan for them. Otherwise you’ll have wasted your time and resources. The CMS said Monday that the benchmark payment rates for Medicare Advantage health plans will go up by 1.25% on average in 2016, a significant departure from the slight decrease the agency proposed in February. When factoring in the expected growth of risk scores coded by insurers, payments will go up 3.25% on average, CMS officials said Monday. However, in a defeat for the health insurance industry, the CMS held firm with its February proposal and will calculate 2016 Medicare Advantage risk-adjustment scores entirely under an updated model. In February, the government said 2016 Medicare Advantage rates would decline 0.95% on average but would rise 1.05% when accounting for risk coding. Early reads of the CMS' 2016 final rate notice for Medicare Advantage plans (PDF) indicate health insurers at least got the higher rates they wanted after they hit the nation's capital with a six-week lobbying campaign—a campaign that drew bipartisan support in Congress. Indeed, the rate reversal was not a change in policy, but “rather (a change) in the actuaries' estimated growth” of per capita Medicare fee-for-service spending, said Sean Cavanaugh, director of the CMS' Center for Medicare. Because more people are selecting Medicare Advantage plans instead of traditional Medicare, spending in the program is higher. More than 17.3 million people are enrolled in a Medicare Advantage plan, according to March data from the CMS. That represents about one-third of all Medicare beneficiaries. Medicare Advantage membership has grown by more than 8% every year since 2010. That large growth and continued popularity spurred the CMS to move ahead with a newer, more accurate version of its risk-adjustment model, Cavanaugh said. Medicare Advantage plans use a risk-coding model to adjust for different demographics and conditions—known as hierarchical condition categories in industry parlance. Each beneficiary's health status incorporates those different categories to predict their future healthcare costs, and that risk score is then multiplied by the baseline rate to determine how much a plan will receive for a specific beneficiary. Insurers are paid more to cover patients who are sicker and have more complications. For example, Medicare will pay a higher rate for an older beneficiary with colon cancer than a younger, relatively healthy senior. But risk adjustment in the program has come under fire, as many healthcare companies have allegedly inflated the risk scores of their patients to garner higher Medicare payments. The CMS has calculated the risk scores the past few years by blending old and new models. The hope is that transitioning to the new risk-adjustment model will weed out procedures and codes that are susceptible to fraud and abuse. And because Medicare Advantage operates in a capitated payment environment, insurers will still have an incentive to try and diagnose diseases and conditions early, Cavanaugh said. Health insurers, though, have slammed the new hierarchical condition categories, arguing they will hurt plans that treat the sickest seniors. A report sponsored by America's Health Insurance Plans, the industry's lobbying group, said the new model will cut payments for members with chronic kidney disease by 23%. The CMS also provided further guidance on provider directories and networks, saying health plans are expected to update their online provider directories in real time. The 2016 payment rates mark the final year of reductions to benchmark rates mandated by the Affordable Care Act. The ACA set out to lower payments to the Medicare Advantage program, which previously exceeded traditional Medicare payments by 14%. Now, Medicare Advantage plans are paid about 2% more, according to the Medicare Payment Advisory Commission (PDF). UnitedHealth Group and Humana are the largest Medicare Advantage insurers. Each company covers more than 3 million members. Kaiser Foundation Health Plan and Aetna cover more than 1.1 million Medicare Advantage enrollees each. More than 17.3 million people were enrolled in Medicare Advantage plans as of March 2015. Year over year, total Medicare Advantage enrollment increased by more than 1.3 million as managed Medicare continues to be an attractive growth market for health insurance companies. The latest CMS (Centers for Medicare and Medicaid Services) reports indicate 54.3 million are eligible for Medicare in the United States and U.S. territories. 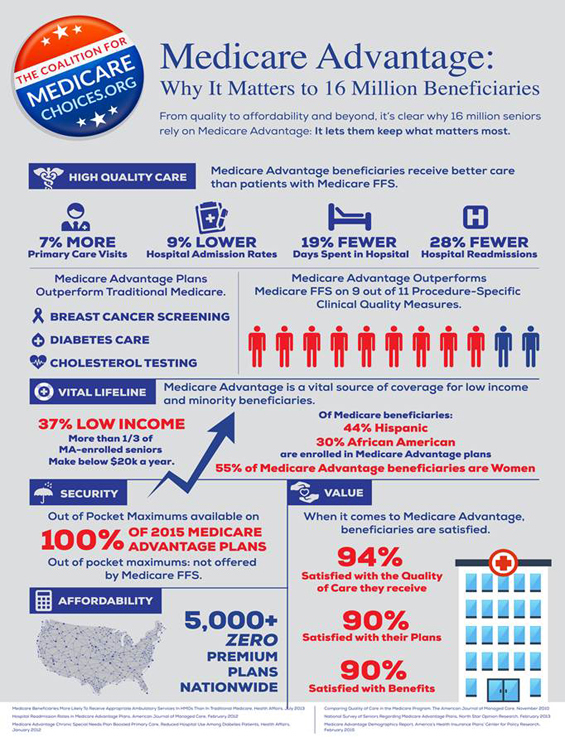 Medicare Advantage (MA), with an unpenetrated market of 37 million and growing, is big business for many health plans. UnitedHealth and Humana lead the segment and each leader enrolls more than 3 million MA members. Kaiser Permanente and Aetna also command significant market share with more than 1.2 million MA enrolled. 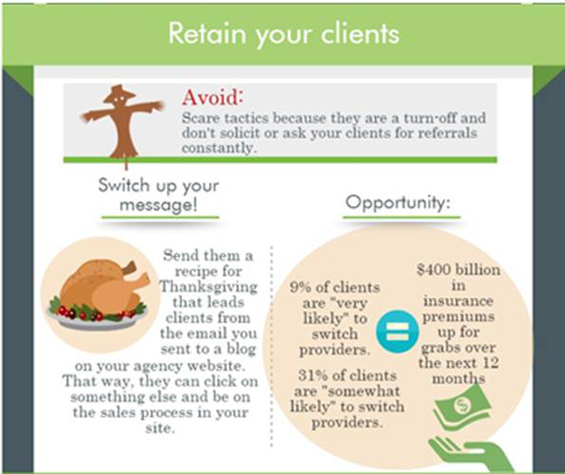 This brief provides insights about competitive positioning in the Medicare Advantage market. We also assess market share for individually purchased versus employer-sponsored benefits and look at changes in Medicare Advantage plan type preferences. Medicare Advantage (MA) enrollment stands at 17.3 million, which represents an 8% increase year-over-year. 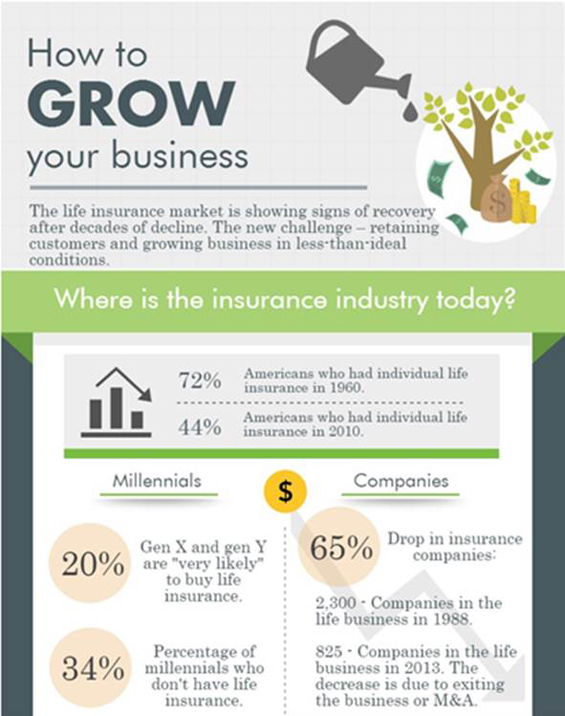 Ten companies, each with more than 250,000 members, have a sizeable stake in this segment and collectively they provide coverage for 67% of the market. Per the reference table below, all leading MA companies realized growth from March 2014 to March 2015 except for Anthem and Highmark. The aggregate net gain for the leading companies, year-over-year, was 8.2% and segment growth for all other MA companies was on par. UnitedHealth retains its position as the top Medicare Advantage organization in the country; with 3.4 million enrolled, UnitedHealth owns 20% of the market. Humana ranks a strong second with 18% share and 3.1 million lives. Kaiser Permanente is positioned as third on the leader board, enrolling 7.5% of the total market or 1.3 million. Aetna trails closely behind Kaiser Permanente owning 7.2% of the market and more than 1.2 million lives. Each year, Medicare Advantage plans rely on February and March enrollment reports to not only evaluate their standing but also assess which competitors gained and lost members during the last AEP (Annual Election Period). The AEP occurs between October 15 and December 7 each year and is also referred to as the Open Enrollment Period for Medicare Advantage and prescription drug plans. This year, Humana experienced the largest gain in terms of membership, adding 369,747 members for a net gain of 13.2%. UnitedHealth's MA enrollment grew by 271,245 for a net gain of 8.5%. Aetna saw a net gain of 13.9%, adding 152,780 members to its MA book in the last year. Per the reference table below, membership gains were fairly substantial for other growth leaders in this segment, ranging from 83,365 for Kaiser Permanente to 32,729 for Blue Cross Blue Shield of Minnesota. The majority of people with Medicare Advantage purchased a plan directly from the company and this is referred to as individual or direct purchase enrollment. As of March 2015, about 82% (approximately 14 million) of MA membership was individual. This speaks to why plans invest considerable time to devise market and selling strategies in preparation for the AEP every year. Only 18% of total MA membership (slightly more than 3 million) originated through an employer group health plan or retirement health benefit. Nonetheless, group membership grew by 6% year-over-year primarily driven by UnitedHealth plan gains. Some companies strategically target group MA business because employers are interested in the cost savings MA plans can offer. 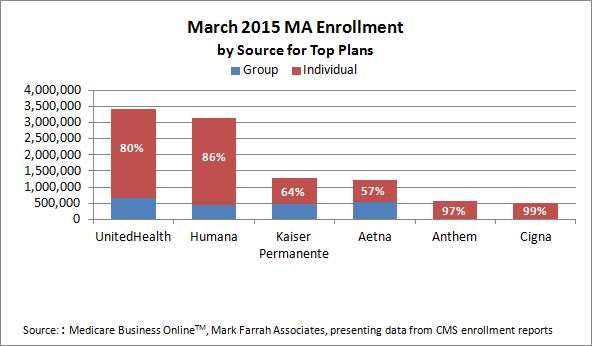 Note that 57% of Aetna's MA membership is through group plans. Though many employers are shifting away from providing retirement benefits, larger volumes of people retiring may continue to sustain group Medicare Advantage opportunities over the next few years. It is important to note that individual and group enrollment counts are slightly lower than total segment enrollment due to different reporting requirements.